Earlier this year, the Minnesota House of Representatives created a new Subcommittee on Metropolitan Council Accountability and Transparency. I was honored to be invited to the Capitol today to testify on House Bill 75 (HF75), one of the proposed bills that the committee was hearing. HF75 would make Met Council plans advisory in nature, meaning that a city or county could not be forced to comply or conform with Met Council projections or guidelines. I feel that this is an incredibly important reform. What we have seen in recent years is a Met Council that has been aggressively attempting to expand their purview over decisions that have historically been the domain of local governments. In all 5 people spoke in favor of the proposed bill, and none spoke in opposition. 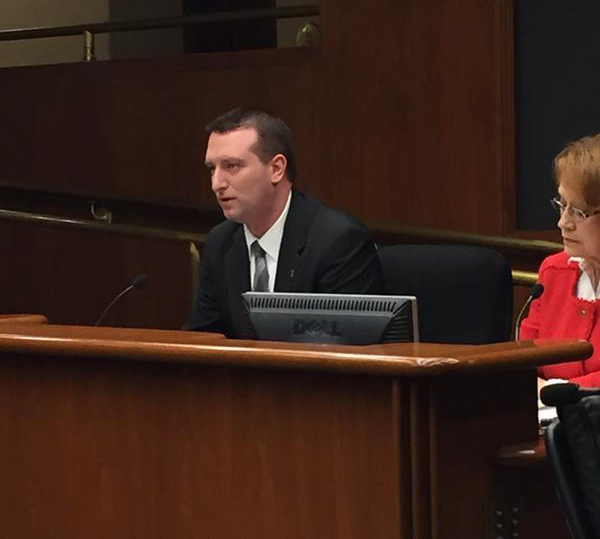 In addition to myself, testifiers included Rhonda Sivarajah, chair of the Anoka County Board of Commissioners, Kelli Slavik, Mayor of Plymouth, Mary Giuliani Stephens, Mayor of Woodbury, and an attorney representing Dakota County. I have pasted below my testimony as prepared. These were just my notes, so I did go a little off script during the actual testimony. There were also some questions that the committee asked that are not reflected here. UPDATE: Audio of the committee hearing is here. My testimony starts around the 22 minute mark. Mr. Chair, members of the committee, thank you for the opportunity to speak today. My name is Jeff Kolb, and I am a member of Crystal City Council. Prior to joining the council I served on Crystal’s Planning Commission. Crystal is a fully developed suburb with a population of about 23,000, located just northwest of Minneapolis (first ring). I am here in support of HF75 which would make Met Council plans and guidelines advisory in nature. I believe this is one of the most important proposed reforms that this committee could take up. The City of Crystal has significant concerns with the Met Council’s Thrive 2040 plan, and the direction the Met Council has taken in recent years. I have with me today copies of several letters that were sent to the Met Council by Crystal city officials regarding our concerns. To date, we have received no meaningful replies from the Met Council to these concerns, only an acknowledgement of receipt of our letters. Some examples of the issues that Crystal experienced with the Thrive 2040 plan were the initial “projections”- (more like goals) that were prescribed by the Met Council for Crystal. In a fully developed city with no new land. For some context, during the years of 2000-2007, Crystal had a net gain of 179 housing units, an average of 22 per year. Those numbers dropped off dramatically during the post 2008 recession. The initial Thrive 2040 projections would have required 107 units per year be added in Crystal, or 5 times the historical rate. The revised projections would require 27.5 units per year, still a rate higher than during the “boom” years. At the same time, Crystal is “projected” to add 1500 jobs, presumably in the same land that would be used to add housing units. Clearly there is a disconnect between reality and these projections. The practical effect on a city like Crystal is that we are required, by law, to create a comprehensive plan. Our city objects to language in the Met Council’s Thrive 2040 plan that seems to mandate that Crystal amend our comprehensive plan to accommodate these “projections,” including a mandate for density minimums. There are several other areas throughout the Thrive 2040 plan where the Met Council seems to overstep its statutory authority by attempting to mandate the adoption of certain transportation and streets policies that have historically been, and should remain the purview of local governments. These encroachments on local government authority are not specific to Thrive 2040, but rather are common place throughout Met Council plans. I would like to read a brief excerpt from a letter sent to the Met Council in September of 2014 by Crystal City Staff in response to the Council’s Draft Housing Policy Plan. Today there are a number of punitive measures that the Met Council can take against a city that does not comply with their mandated “projections” including denying grant funding or even suing a city to force a change to their comprehensive plan, as has happened in the past. By passing HF75, you would clarify that Met Council plans are indeed advisory in nature, not binding documents that can be used to infringe on the ability of cities to govern themselves. The West Metro Fire-Rescue District Board of Directors met on February 18, 2015. I was appointed to be Crystal’s representative on the West Metro board earlier this year, and this was my first meeting. 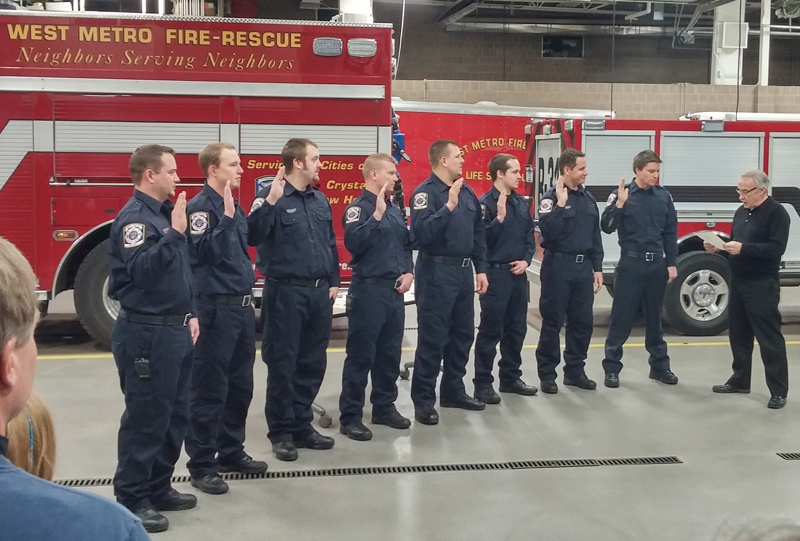 The meeting kicked off in a fun way- with the swearing in of 9 new firefighters and one new lieutenant (pictured above). After that we headed back into the meeting room to get the meeting started. We first dealt with some old business- things that were discussed at the end of last year before I became a director. We passed a revision to the by-laws that was made redundant by recent changes to the joint powers agreement, accepted the chief’s 2015 goals for the department, and discussed how the department will allocate donations it receives from the West Metro Relief Association. The Relief Association has a charitable wing that earns revenue from charitable gambling (and other sources), which is in turn sometimes donated to the department. For instance, the Relief Association donated $7,500 to the department at Wednesday’s meeting. The discussion was about where the donated money would be allocated, and a few accounts were identified for those funds. Next we went on to new business- approving the purchase of a new Chevy Tahoe to replace an old Ford Expedition, approving the purchase of some furniture for sleeping quarters for when firefighters spend the night at the station (during extreme cold weather or when they need to be on standby for major events), and the purchase of some iPads which will replace old laptops that are at the end of life. The only item on the agenda that generated any significant discussion among the directors was the next item, which is a plan to replace 3 part time fire inspectors with one full time inspector. The department has had turnover in their part time inspector ranks and feels this will be mitigated by going to a full time inspector instead. I had concerns with this approach on two fronts- 1) that we are trading 72 hours per week of inspection time for 40 hours, and that 2) the cost went up to do so, based on an increase in wages, benefits and pension for full time employees. The chief felt that the increase in productivity and decrease in expense based on lack of turnover would justify the new plan. In the end it seemed that I was the only director who had any reservations, and the item ended up passing . I did end up voting in the affirmative, as I didn’t feel I had enough information to vote against the measure, and decided to trust the judgement of department management on this issue. Next we moved on to preliminary discussion about the 2016 budget. Although it’s only February, the West Metro budget needs to be started now, because it must be approved by the councils of both New Hope and Crystal, and that needs to be done before the cities can work on their budgets. So we’ll be discussing the budget in more detail at the next meeting. One thing that I need to mention is the fifth annual “Firefighters Fighting Hunger” food drive. It will be held on March 21 this year. Last year our firefighters collected enough food and cash to provide over 10,000 meals! Please see this link for more details including where to drop off food. West Metro’s board meets every other month, so the next meeting is April 8 at 6:30 PM at First Station 3 in New Hope (next to New Hope city hall). 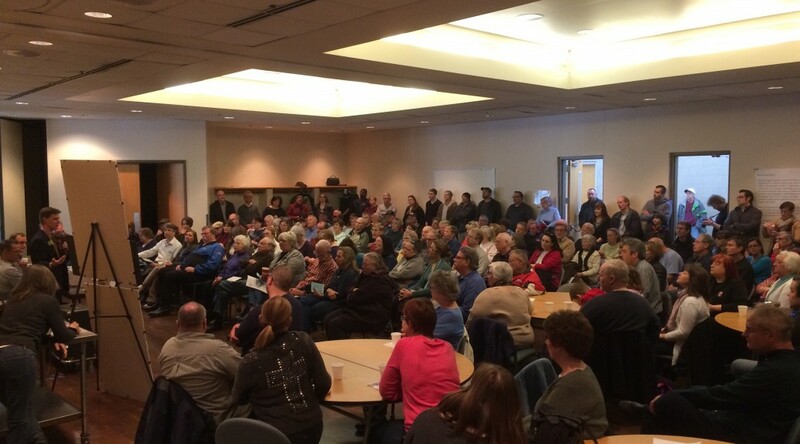 The Crystal City Council held Citizen Input Time, two work sessions, an EDA meeting, and a council meeting on February 17, 2015. While trains dominated the discussion this week, this recap is going to skip discussion of anything involving trains. Please see this post from councilmember Olga Parsons and/or this post from me for more details on that issue, including what you can do to help out. Citizen Input Time is a time when citizens can come address the council on any topic in a more informal setting than during the council meeting. There is usually a session scheduled once a month prior to a council meeting, except during the summer. Check the schedule for upcoming dates. We heard from three citizens at Citizen Input Time. Two on the train issue, and one on an issue regarding a pond located near The Heathers. Staff is following up on the pond issue, which has been ongoing. At the first work session the Human Rights Commission presented their 2015 work plan. We’ll have more on this soon as the council discusses generally what our strategy will be regarding commissions. Now, on to the regular meeting, which kicked off in an exciting way- with a proclamation from Mayor Adams that February 18, 2015 is Matt Borchers Day in Crystal. 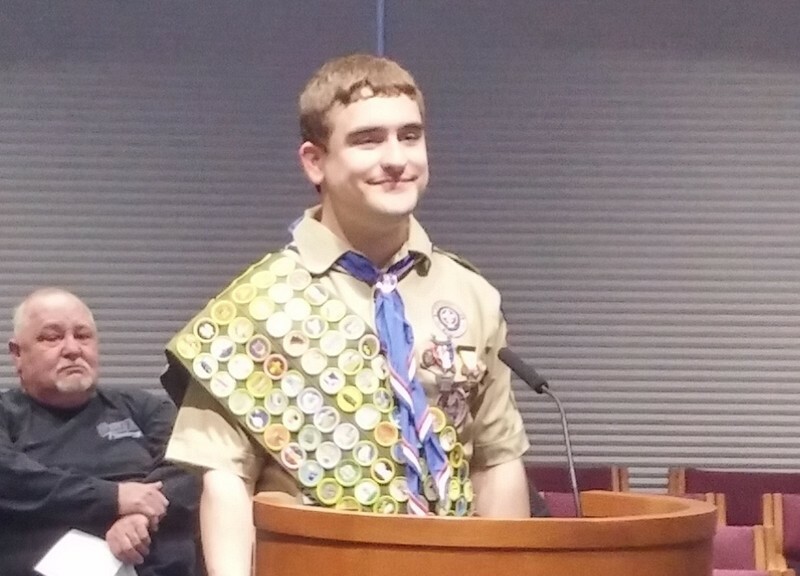 Matt is an amazing young man who achieved the rare goal of earning all 139 Boy Scout merit badges before his eighteenth birthday. Read more about Matt and his accomplishment here. The next item on the agenda was a public hearing related to the allocation of Community Development Block Grant (CDBG) funds. The CDBG is a federal program that has been in existence since the Ford administration. Crystal receives about $100,000 each year from the federal government under this program, and we have some limited choices on how to allocate these funds. Historically, Crystal has put all of our CDBG funding into a deferred home improvement loan program. This allows residents who meet an income requirement to apply for a loan to improve their home. If they stay in their home for 15 years, the loan is forgiven. If they sell, it must be paid back. Demand for this program varies from year to year, but last year we ended with a waiting list of residents who wanted to take advantage of it. We do have the discretion of allocating some of our CDBG funds to other limited purposes, such as certain social services organizations. Each year we do get some requests from organizations seeking part of Crystal’s CDBG allocation. These organizations typically receive funding from the CDBG allocation of other cities, and want to also receive funding from Crystal. There was discussion this year, as there was last year, to change our allocation to provide social services funding. There are many great social services organizations that operate in our area, and they can each make a very compelling case for funding. However, the deferred home improvement loan program has been working, and working well in Crystal since the 1980’s, and the goals of that program align with the intent of the CDBG program. Other cities have not seen the same level of success with the loan program, and have ended the year with unspent funds. In those situations, it may make sense to allocate to other programs, but that isn’t the reality in Crystal. We have the opposite situation, where we don’t have enough funds to meet the demands of an established program. There was a motion to change our allocation for 2015 to include social services funding, which failed 5-2. The vote to allocate 100% of the CDBG funding to the deferred home improvement program passed 6-1. We had a few non-controversial issues next, including approving the transfer of a liquor license to a new owner, appointing two new members of the planning commission, ordering a feasibility study for phase 8 of the alley reconstruction program, and authorizing the purchase of some planned equipment for the new public works facility. Next we moved on to the consideration of a change in our zoning ordinance to allow impound lots as a conditional use in the industrial zone. This was prompted by the rail project, which would take the land of North Suburban Towing, which has been operating an impound lot in Crystal for decades. Our current zoning doesn’t allow impound lots anywhere in the city. North Suburban Towing is allowed to stay where they are indefinitely because they are “grandfathered in”. However with the railroad potentially taking their land, they would be forced to move, and our ordinances would prohibit them from relocating in Crystal. So unless we change the ordinance we’d lose a long time business because they had to relocate through no fault of their own. The new ordinance allows impound lots in our industrial zones, subject to a few restrictions including minimum lot size and fencing requirements. We also considered the change of the ordinance governing second hand goods dealers, as it was found that it would apply to a new business who wants to sell refurbished appliances, which was not the intent of the original law. To solve the issue we listed refurbished appliances as an exception. That change also passed unanimously. That was the last item on the regular meeting agenda. After that we had a quick EDA meeting where we authorized some plat changes to allow us to sell part of an irregularly shaped lot held by the city to the adjacent homeowners. It basically takes a triangle shaped lot and makes it a rectangle. We’d sell the other triangle pieces to the property owners who back up to the lot, making their lots more regularly shaped as well. After the EDA meeting we went into a work session focused on trains. The next meeting and Work Session will be Tuesday, March 3. My colleague Olga Parsons wrote a great recap of the latest round of updates on the train situation, so if you want the details, please head over to her site to check it out. In the meantime, many of you have asked what specific actions you can take to make an impact. Our Federal elected officials need to hear from you on the importance of this issue. The Surface Transportation Board, a Federal agency, has some discretion on whether or not it will require an Environmental Impact Statement (EIS) before the connection can proceed. We need to do everything we can to make sure that a full environmental review is performed. Please consider contacting our Federal officials by phone, mail, or email. Ask them to petition the Surface Transportation Board to require a full Environmental Impact Statement for the proposed rail connection in Crystal. Also, Governor Dayton wrote a letter to the acting chair of the STB today, and it does a good job of succinctly explaining the issue. Check out that letter here. The city of Crystal is currently seeking applicants for four (4) representatives to Metro Blue Line Extension (BLRT) Advisory committees. We have two positions on the Community Advisory Committee, which represents our community and residents, and two positions on the Business Advisory Committee, which represents our business community. These are new positions on new committees. The committees will jointly advise the Met Council and Hennepin County on the proposed Blue Line Light Rail project that would go through Crystal. Committee members will be appointed by the city council and will serve a two year term (through December 2016). If you are interested in providing feedback about the Light Rail project in Crystal, this is your opportunity to formally join the process. The deadline to apply is 4:30 PM on February 27. To apply, or to see the job descriptions which will provide more information about the positions, click here for the application packet. If you have any questions about the process, please contact me. Today the city posted a new information packet about the proposed rail project that I wrote about a few days ago. The packet is a summary of what we currently know about the project. Not too many of the details have changed since last time- this update basically confirms much of what was rumored, though some new detail is provided about the permitting process that the railroads will need to go through in order to make this connection. Crystal city staff has had a face-to-face meeting with representatives from Burlington Northern Santa Fe (BNSF) to gain clarification about details surrounding the project. Our staff also held a meeting with our legislative delegation (Reps Carlson and Frieberg & Senator Rest) some legislators from Minneapolis, a member of the Minneapolis Park Board, representatives from Robbinsdale and Golden Valley, and a senior transportation policy advisor to Governor Dayton to discuss a coordinated approach to responding to this project. Hennepin County Commissioner Mike Opat had a discussion with Senator Klobuchaur’s office to try to engage our federal officials on the matter. This project should require an Environmental Impact Statement (EIS) before it can proceed, but there is a concern that BNSF may be trying to circumvent or evade this process. Crystal city staff will be following up directly with the Surface Transportation Board (STB), which is the federal agency that regulates this type of rail activity to try to ensure an EIS is required. If an EIS is found to be required, there will be a public comment period, which will be the chance for Crystal residents to formally provide feedback about this project. There is a good chance the Crystal Council will be discussing a resolution opposing this project at the next council meeting on February 17. While this type of resolution would not give us the authority to stop the project, resolutions like this can be used as a tool to clearly state the city’s formal position on a topic. Finally, I have received a few question regarding “quiet zones.” When a quiet zone is implemented that means trains passing through the area would not use their horns. We are looking into what it would take to implement quiet zones in Crystal as part of the overall discussion regarding freight rail. I don’t have any more details on that yet, but I have requested information from our staff, and requested that quiet zones are discussed in any meetings about this project. As always, I will post more once I know more, and will do my best to answer questions where I can. Please don’t hesitate to contact me if you have any questions.